I don't have time to post so regularly at the moment. I am baking lots of bread, and continuing to work hard to develop my business. 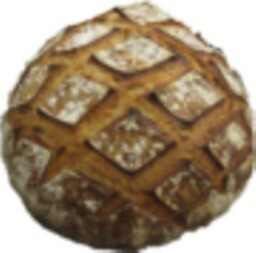 I have finished my spell working at Dunbar, and am now pushing forward with my quest to have a small bakery of my own, preferably here in Powburn, where I live. I will write more on this, no doubt, as it progresses. For now, I have secured a 2 deck electric oven, and have access to various bits of kit and machinery to add to what I already own. That's enough to get started, so discussions now centre on securing premises; that is underway. In the meantime, we are continuing to supply the Farmers' Markets at both Alnwick and Hexham. Last Friday, we sold out at Alnwick around 12:30pm, even though the weather was pretty poor. Feedback about the bread continues to be very positive, and now there are a few outlets approaching in search of regular wholesale supply. So, I am really happy with the progress, although am keen to get into a full-production situation as soon as possible. We had a very welcome guest come to stay with us in Powburn recently. En route to join his wife for a holiday in Prague after she had completed a period of study, TFL's Franko, a fellow professional baker who lives on Vancouver Island, came to the UK for a much-anticipated short trip. We baked for, and attended the Hexham Farmers' Market together and enjoyed some relaxing time out in Northumberland with my wife, Alison, as well. The Red Fife is quite delicious; organic wholewheat, a traditional strain which is the base of nearly all the strong modern wheat varieties used to produce today's Canadian strong wheat. It has a great history which takes in both Hungary and Scotland en route to Canada too, back in the 19th Century. 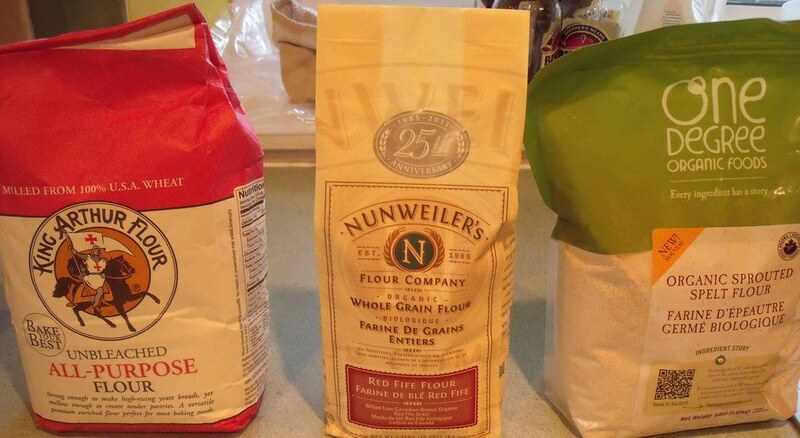 The King Arthur All-Purpose flour confirmed what I had long-suspected. It is a bread flour by UK standards; it makes a delightful loaf of bread, although my preference is to avoid all-white bread as many here know. 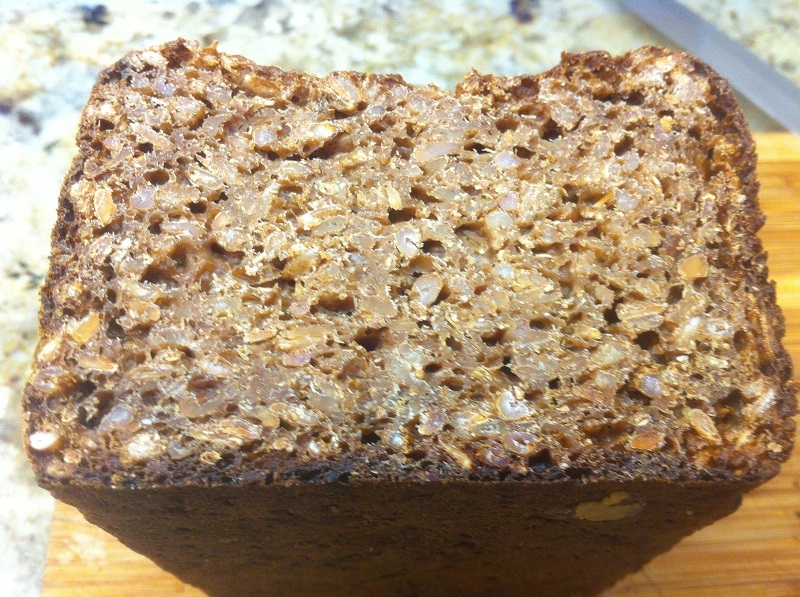 Mixing the King Arthur flour with some Red Fife and a small portion of rye sourdough created a very tasty loaf. We made the dough into miches...quite big ones too at c.1.5kg. I had recently bought some Swiss Dark Flour as a treat from the Shipton Mill website. I didn't have a clue about the strength of the flour, but had an e-mail from Clive at Shipton explaining thatthe flour was milled in a way which captures the Pollard streams. Kent (4th ed; 1994) makes reference to Pollard as an Australian term for wheatfeed, implying it is the layers of the grain inside of the bran layers, and outside of the endosperm. Sounds like the aleurone layer to me, although I lay no claim to expert knowledge of milling. Anyway, the flour produced a lovely dark loaf. We made this using my wheat levain only, plus a little salt, of course. Lastly, we made some 100% rye loaves, as Franko was on a mission to discover more about the Bacheldre Organic Whiolegrain Rye flour which I have been using for sometime now. Some of it went back to Canada to reciprocate for the gifts brought for out UK baking. We made some Borodinsky loaves and some Black Pumpernickel. Both are 100% rye, and use complex 3-stage fermentation. The next day we had a very early start to visit my colleague Nigel, and bake all the bread for the Hexham Market, and more besides; c.130 loaves. Overnight temperatures were very warm, and my leaven was "over" by the time I got up at 03:30! I got away with the Spelt dough, somehow [the visiting pro being largely responsible for salvation]. But I decided to refresh the leaven once again before using it to make the doughs for Gilchesters and the Five Grain. The Gilchesters' is made with local high extraction flour, and I had 2 doughs in excess of 10kg on the production schedule. So we made the dough at Nigel's house. It all worked very well indeed. Nigel had made his white dough overnight, and had a Golden Linseed and Light Rye made besides. I took the Spelt dough and then made the Gilchesters and Five Grain doughs, plus 10kg paste for Moscow Rye. It all seems like a lot of work. But, with 3 bakers, and a wood-fired oven which holds 40 x 600g loaves to bake on the sole of the oven at any one time; well it all went very smoothly and we had finished baking early-mid afternoon in record time. Nigel's oven is such a serious beast, so once fired, it holds the heat in for many hours. Franko and I drove to Hexham early Saturday morning and set up our market stall. Nigel arrived with the bread which we set out for display. The bread was great; a pleasure to sell. Two of us behind the stall meant we could create a great ambience too, and this meant we sold out of bread around 13:00. There is much competition for bread bakers on the Hexham market....4 of us, and there are a few outlets within the main shopping centre which offer artisan bread as well. I love to sell out of bread; a friendly companion alongside made it even more enjoyable. We rested up a little late Saturday afternoon, then Alison drove us to the beautiful Northumberland Coast, where we had a table booked in a lovely pub at Newton-by-the-Sea....a big favourite of ours. 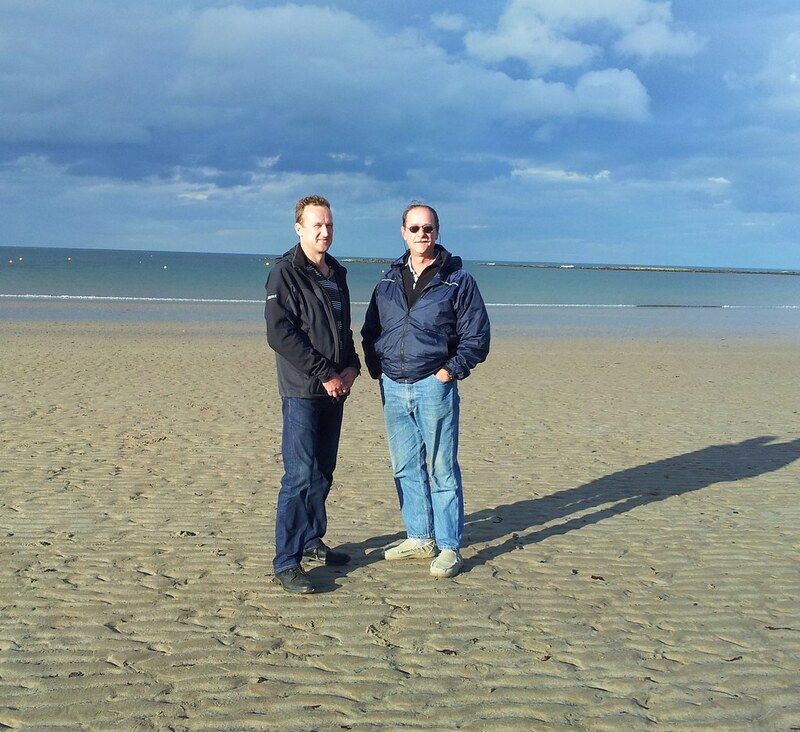 We went down onto the beach first, and soaked up some evening sunshine. Alison took these fine photos on her phone! The impressive castle in the background is Dunstanburgh; we so love the Northumberland Coast! After Franko left bound for Prague, I had to set to and bake for the Alnwick Farmers' Market coming up the following Friday. I baked flat-out for 3 days, producing over 30 loaves each day on my little wood-fired oven. It was enough, and I turned up on Friday just gone with several basket loads of bread and a range of pastries. I was joined by my neighbour Anna too. She is not only a champion of our bread, she is a great salesperson too! So, I was home before 13:00h, with a load of empty baskets. Today I have been baking again. You can see the breads I have made in the photographs below. Nigel is catering for a group of 20 walkers following the St. Cuthbert's Way, which runs through Powburn. He baked some bread for the first leg of the walk, and is calling here to collect replenishment! I baked more bread besides; some for my business partner, whose family I have lined up as taste-testers for when I get into production -proper. Also, I have landed an account with a business called Muddy Boots, which will open as a cafe in the former Visitor Centre at Ingram in the National Park....it's only 5km from Powburn, into the Cheviot hills. So there were more samples for Jan [owner] to collect and try. Well, I'll try to keep you all posted with further progress as and when it happens. The game remains natural leavens and organic flours; for the moment it's wood-fired brick ovens too. And, in the long term, larger-scale baking on brick ovens remains the goal. Plus teaching, Consultancy, Community baking...let's keep real bread alive and drive it forward here in the UK. Andy. Great that Franko could visit and bake with you too. Nice to have company by the WFO - especially when they are pro bakers. Sounds like a great time was had by all on the coast. The pictures are serene. All the breads looks great and your selling out early is no surprise. What a wide varietyof bread too. That sums it all up in a word DA; I'm always busy. But, patient, and now a bit confident too. Many thanks for all your kind comments. That is so cool. Glad that you and Franko could meet up! What can I say Floyd? You set this site up, and you run it so well! That's where the opportunities come from. A big "thank you"...will that do it? It's lovely flour, but it confirms what I suspected all along. In terms of "quality", you North Americans are quite spoilt! But when you combine a flour like the King Arthur brand with something such as the Organic Red Fife; that is really special. We had a business meeting this morning, and had a sample of the Miche. The flavours were what I absolutely WANT in a loaf of bread..
That said, I'm very happy with the Marriage's Organic Flour as my standard bread flour; it stacks up well. your comments about my business plans are very much appreciated; it is moving nicely just now! I can't believe how much you get into a one day's plan. What an amazing quest Franko experienced. I'm sure he'll never forget it. Your breads just keep looking amazing...no wonder they are in such demand. Thank you for taking the time and sharing all. Beautiful photos! In terms of a day's work, Franko turns out a lot more bread than this in his own environment. But you are right; Nigel's oven is a joy to bake on. His design is superb, and it fills me with great hope for my own baking future too! Your positive comments are so much appreciated, as always. I'm sure we will both succeed in the end. It's really wonderful you and Franko were able to spend time together baking and working the market - I'm sure the 'hosting pro' and 'visiting pro' enjoyed each other's company very much! It's so generous of you to send Franko home with Bacheldre flour to bake with - what gorgeous loaves it makes, those crackled ryes. So good to read you're gathering all that you need to start your bakery business - and wish you every success; the bread speaks volumes, and your customers are listening (happy to read there were sell-outs at all of the markets!). The photos of the breads, and coastline, are lovely. One word to sum up the business venture; excellent. Speak carefully to Franko, methinks there's a bit of Gilchesters' stashed in his case too! Your kind and generous words are much appreciated, as always. Thank you. I'm glad you and Franko enjoyed so much pleasure time together. The flours brought by Franko are one the best in the world, and the resultant breads are a testimony to the skill and passion involved. The joy of the flours was that Franko brought some native and traditional Canadian flours; fantastic authenticity too...and I shared similar with him. Bacheldre Rye is organic wholegrain from a Welsh watermill, and you know the Gilchesters is sourced fromsingle-strain Sativa organic wheat sourced from Germany, but grown, exclusively in the UK, here in Northumberland. I learnt that "KA-AP" is easily matched by the Marriage's Organic Strong flour I like to use! I am very excited too, of course. Well we finally made it back home last evening after a long flight, weary, but with lots of great memories of our times in the UK and and the Czech Republic. Things look like they're developing quickly for you in regards to your own shop Andy, thrilling news to be sure! Like everyone else who's commented, I couldn't be happier for you! I managed to save half of the pumpernickel you sent me away with and have had a few slices for this morning's breakfast. I guess I may be one of the fortunate few on this forum to have actually tasted your breads, and in particular your pumpernickel so I feel very lucky indeed to be included in that group. The flavour is exceptional my friend, and even better still now that it's had some time to age a bit. To me, this is a bread that one could build a successful bakery business around. Heaven knows it's been done before with breads that don't come close to the quality of your pumpernickel and the other breads of yours I enjoyed during my visit with you and Alison. Hopefully with what I learned from you during my visit will allow me to produce something of a similar quality but the you've set the bar quite high so no predictions on the outcome quite yet. Many thanks for sharing some of your Bacheldre and Gilchesters stock with me, can't wait to have a chance to try it in some of my own breads although I imagine the Bacheldre will be used primarily for pumpernickel or other 100% rye breads. Sometime over the next several days (time permitting) I'll sort through my photos and try to get something written up of our baking adventure together, as well as a few photos of my time in the Czech Republic. I'm afraid I got skunked in tracking down any small craft bakeries in Prague or the other two towns we visited, and except for one restaurant we tried, all the bread was pretty ho-hum. From my point of view that makes an excellent excuse to go back and look some more, and another visit with you and Alison would of course be included in the itinerary. Thanks Andy for a great experience, and for the hospitality that you and Alison showed me during my stay. Say Hi to Nigel for me when you see him next as well. Well it's nearly a week old now, fantastic that you are so positive about the Pumpernickel. As you know, I have 3 x 100% Rye loaves, and also the Gilchesters' breads which are the cornerstones of the business. The Seed loaves and 5 Grain featured here are also key. Nigel has a great white bread; I need to up the stakes here. But, I'm so not enthusiastic right now. BUT, lots to do, can't wait. Fantastic to meet up and spend time together. Nigel was here earlier today to collect bread...but before I found your post. I will pass on your message, of course. Thanks for the update, Andy. I cross my fingers for your venture, and hope no over-zealous regulations will create hardship for your opening a bakery. 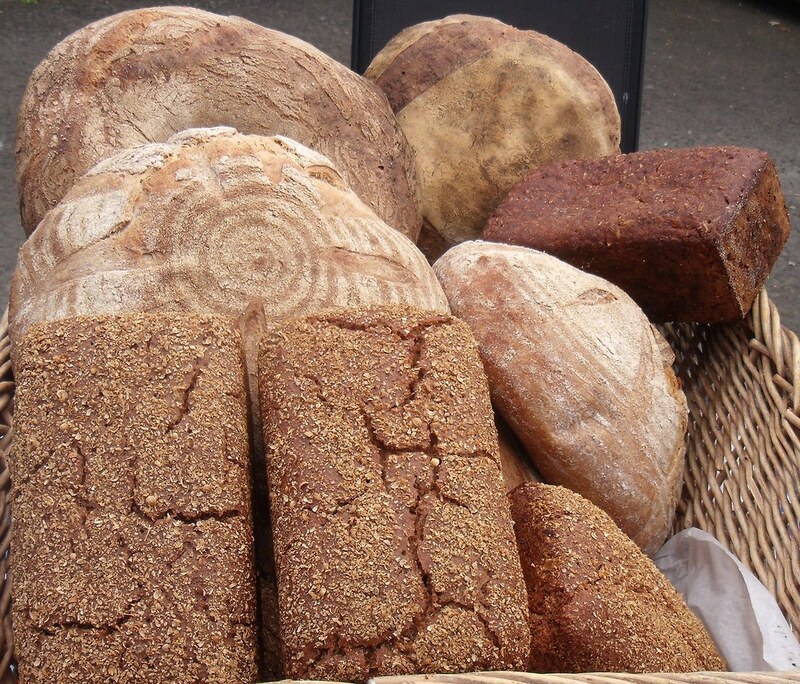 No wonder, your breads fly off the market stand, they look wonderful! Your farmers' market organizers are definitely wiser than their colleagues here in Bar Harbor - I applied, when I started out selling my breads, but they already had a baker and didn't want any competition. Nice, that Franko had a chance visiting you, and you could even bake together. TFL is a great place to meet like-minded people! I bake a lot with organic King Arthur flour since they are in our neighbor state Vermont, and have good qualitity products (and very good recipes on their website, like the English Muffins I made in Hamburg). What I also like about that company is the fact that it's entirely employee owned. Should be ok with food safety legislation. I've got the advanced qualification from a few years ago, so the authorities are pretty supportive and trusting. Also, I don't do any "high risk"! With Farmers' Markets, it is tricky to get on and become accepted. We are slowly nudging into Newcastle, which is our big city. But we cannot get into Morpeth, which is the administrative centre of Northumberland. We have got in at Alnwick and Hexham, which are the 2 touristy towns, with lots more history and character about them. But you have to persevere, and accept that getting on, then becoming a regular, and successful trader can be quite a long journey. TFL; what can you say? I've met Codruta, Yozzause and now Franko, and we also had the great UK TFL meet up too. It's fantastic. I prefer [English] Muffins made with overnight biga, but not soudough. I'm sure the King Arthur flour is great for these. The bag Franko brought was not Organic. Yes, my first business was a Workers' Co-operative; I have long been committed to employee-ownership as a means to do business.